Thanks for this post Hannah. I learned something new today, which is always a good thing, and this dish looks delicious. I'll be sharing the link on my FB page tomorrow. Thank you, Aunt B! I'm happy to share this dessert with you - definitely one of my favorites. I appreciate you linking to it, too. Hope you are enjoying the holiday season! Hi - I haven't tried that combination of cheeses before with this recipe, but it does sound delicious and like the textures would work well. I would imagine it'll be a bit salty with the feta, so perhaps using a higher ratio of cream cheese in the mix would be good. Please let me know if you make it - I'd love to know of other variations! Latkes and wine are delicious calorie choices, Alyssa! I'll be indulging, too. Happy Hanukkah to you! Wow - this is so interesting - I didn't know about shredded phyllo or this cheesy (no pun intended) baklava-like cake. Gosh I really want to cook with you Hannah! I think I would learn so much! Aw, thank you, Beth! 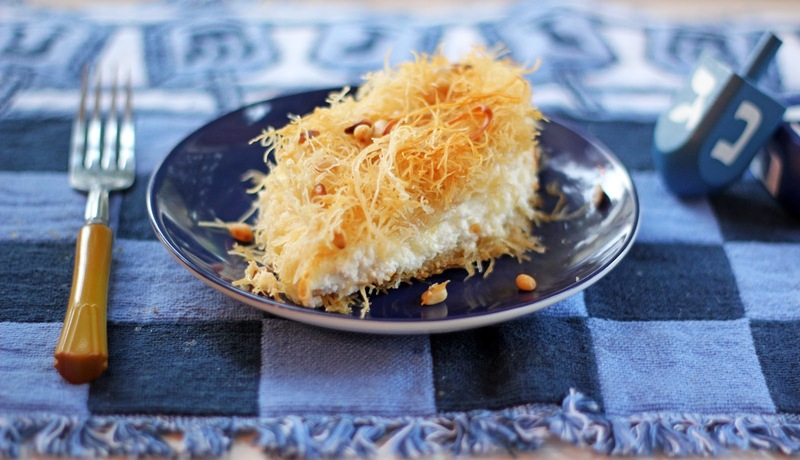 Shredded phyllo is wonderful and is terrific to use for other desserts, too. I hope we can cook together someday - what fun that would be. Happy Hanukkah! Oh my! Now that's a pretty little thing, isn't it? This sounds WONDERFUL!! Thank you, Brooke! Isn't is a pretty dessert? I love the look of it, as well as the taste. Hope you are enjoying the holiday season! Oh how beautiful!! i really love that the phylo is shredded, what a perfect addition to a holiday meal. A very happy Hanukkah to you and your family! Thank you so much, Suzanne! This is a very festive dessert indeed. This is such a fun time of year. Hope you are having a lovely holiday season! This is so unique... nothing like what i have ever seen before. Looks delicious of course :) Happy Hanukkah! Thank you, Chinmayie! 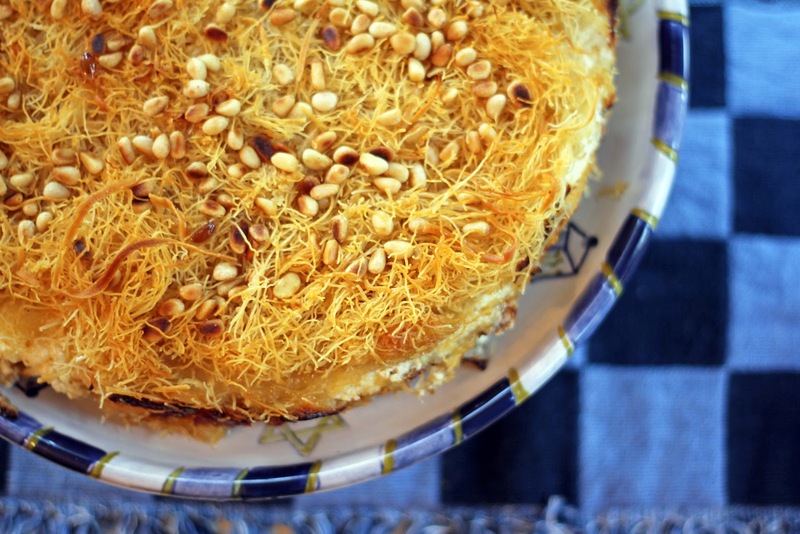 Konafa is delicious and a crowd pleaser - it always looks festive and pretty, too. Hope you are enjoying a wonderful holiday season! What a beautiful dessert! It's bound to taste as good as it looks with all those fresh cheeses. I'll have to see if I can get phyllo in Lima. Thanks! Thank you so much, Vespa! I hope you can find some shredded phyllo. The fresh cheeses are lovely, and I've also seen goat cheese as an option so I'd like to try that version, too. I appreciate you stopping by! This does look great. However as I'm from Israel I just have to comment that the is called Knafe, and it is an Arab dessert- it is extremely tasty! Also, this is usually made with goat cheese. I know it sounds weird but it is delicious! Thank you for sharing these photos - I particularly like the individual ones and will have to try that method. Using goat cheese sounds divine! I will definitely make it with this cheese next. Happy Hanukkah! This looks wonderful, but just so you know this isn't knafe/konafa. These are different types of cheese which will result in completely different tastes and textures. It is also generally a lot thinner and not made with lemon. This seems like more of a cheesecake baklawa hybrid, as you mentioned. Don't get me wrong, I still am looking forward to trying this recipe! Thank you! I understand what you're saying. 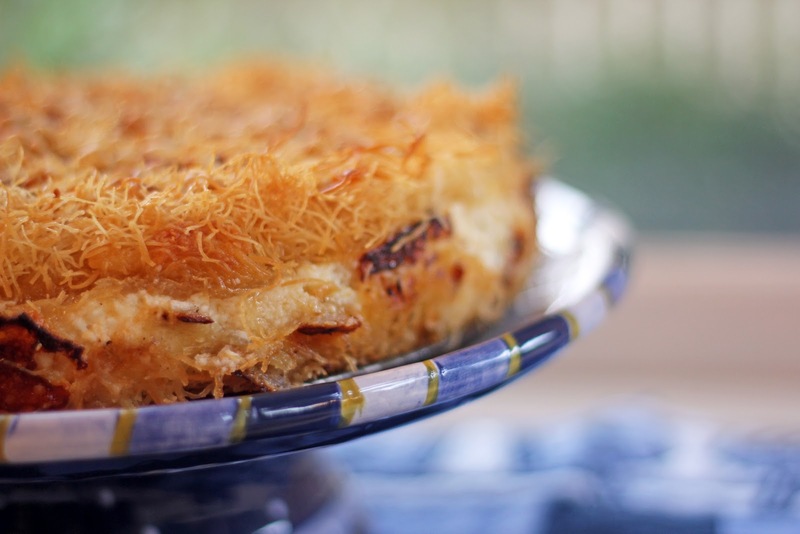 In looking at different konafa recipes, I've seen many variations of fillings using different soft cheeses or thickened milk, often based on where the konafa is made. In this case, I adapted a recipe I like and made it a little thicker and with a lemon syrup that's more to my taste. I hope you enjoy it! Hi. I just wanted to correct your origin on what "Kanafeh" is. Please find the Wikipedia article here: http://en.wikipedia.org/wiki/Kanafeh. it is not JUST a popular dish in "Israel" Egypt and Lebanon, it is a traditional Palestinian pastry/dessert. Please get your facts straight before posting on a public blog. Thanks. Thank you for your comment. I've never been clear on the origins of konafa as some older sources cite Syria and Lebanon. Sounds like you can get terrific konafa in Nablus. I appreciate learning more about this special dessert. This is gorgeous, Hannah! I've never heard of this dessert, and just love, love, love it!! Pinned to make it soon. Hope you're having a wonderful holiday season! Thank you, Susan! I hope you enjoy the konafa - it's such a delicious, unique treat. Wishing you a marvelous holiday season! Hooray!! I was hoping you would post this! I've got leftover Katafai in my freezer, so this is definitely going on the list. Looks spectacular!! This looks great. 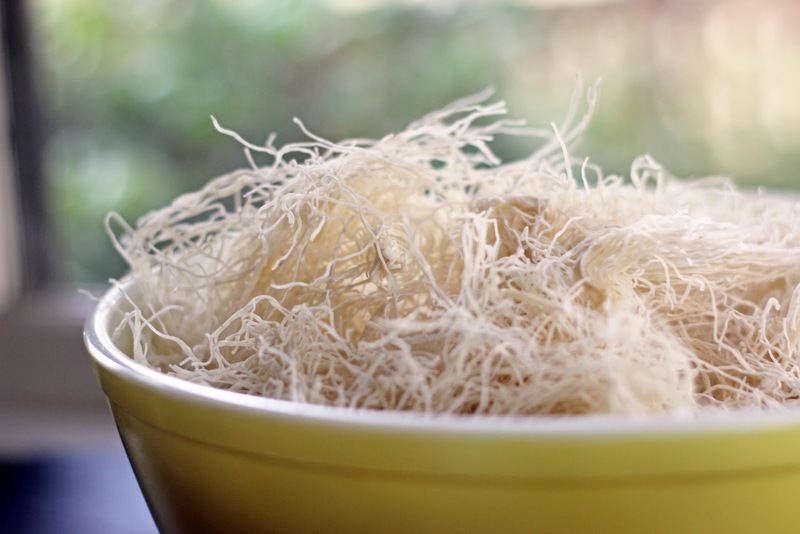 I've had this shredded phyllo dough before in variants of baklava. Yum! Happy holidays to you! Thank you, Sara! Wishing you a wonderful holiday season! I'm going to have to see if our local middle-eastern grocer has some shredded phyllo. Cheesecake is Paul's favorite dessert (especially with lemon!). Sounds like there's been a lively discussion on the "correct" Konafa. (Israel in quotation marks? Really?!) You were so polite to ol' Anonymous. Anyway, this made me glad that 17th-, 18th- and 19th-century British people can't comment on the "authenticity" of some of my recipes! It would be so boring if we food bloggers never took liberties with source material. Aw, you made me smile, Lauren! :) I hope you can locate some shredded phyllo and that Paul enjoys the konafa. Merry Christmas! That does look truly spectacular! Happy Hanukkah! Thank you, Lisa! I hope you're enjoying a wonderful holiday season! Love! I want to eat this now & the latkes & the doughnuts! Happy Hanukkah Hannah! Thank you so much, Mairi! Wish I could share some konafa, latkes and doughnuts with you. Hopefully someday! Merry Christmas! Hi Jen - I'm delighted you're going to try konafa! It's lovely and quite different than NY cheesecake (of which I am a big fan - the recipe you found looks scrumptious). I hope you enjoy it! Please let me know if you have questions and how it turns out. Thanks for stopping by! I love konafa. I've never worked with shredded phyllo, but I do love eating it! Thank you, Gayle! I think you'll appreciate the ease of shredded phyllo if you ever work with it. And it is tasty! I appreciate you stopping by. Happy Hanukkah to you! Oh wow...that sounds FANTASTIC. I've never seen shredded Phyllo dough though and would love to make this. I know my challenge for the day...to find some! Thank you, Barbara! I do hope you can find shredded phyllo and that you enjoy the konafa. With your baking talent I'm sure you'd create some other lovely sweets with the phyllo, too! This caught my eye on foodgawker because I looked up "cake" and thought I'd come across a picture of a fuzzy little animal! What an interesting dessert! I noticed some of the comments on here are frankly a little bit rude. Cheers to you for taking a traditional cake and making it suit your own tastes (which is kind of the whole point of being a recipe developer, right? ), and great job on your wonderful responses. This cake looks like something I may try. It just sounds so unusual, and the visual is stunning. Thanks for sharing! I've seen this dish before! I was really fascinated by the topping (of course! So unique!!). What a gorgeous cake and I really wish to try this one day. I will never forget! I'm delighted you've seen this before, Nami! The topping is indeed distinct with its rather wild look. I hope you enjoy it if you have the chance to bake one. Thank you so much, Ken! I appreciate your kind words. As soon as I locate some salt cod I'll be making brandade...such a treat. I'm with you on these kinds of pasty - worth every bite! Claudia Roden is truly an inspiration. I read her cookbooks like novels! I'm happy you stopped by. Hope you're enjoying a wonderful holiday season!